NEWTON – Junior quarterback Braedan Crites found senior wide receiver Layne Bieberle for several outstanding catches, including a leaping, outstretched grab by Bieberle in the end zone. Central Plains’ defense, ranked No. 1 in Eight-Man, Division I, followed its mantra of bend-but-don’t-break. The smaller, athletic Oiler line used leverage to their advantage up front. Those three factors were key for Central Plains all season, and again Saturday against Hanover in the state championship game. But the Oilers used a wrinkle late – a 45-TD run by Bieberle off a direct snap – to secure a state championship with a 42-30 victory at Newton’s Fischer Field. Bieberle, eight-man’s all-time leader in career receiving TDs, carved out an impressive finish to his remarkable career. He helped Central Plains, ranked No. 2 in the classification, to a 13-0 finish. Hanover, the No. 1 team and favorite, finished 12-1. It marked the first state title in the fourth football year of Central Plains, the consolidation of Claflin and Quivira Heights, two longtime football powers. Bieberle hauled in seven catches for 186 yards and two scores, forced Hanover into two defensive pass interference calls, and added the 45-yard run off the Wildcat direct snap, the first time the Oilers had used the play. In addition, Bieberle, also the team’s punter, drew a roughing-the-punter penalty that earned a key first down and intercepted the game’s final play. Crites finished 13 of 22 for 245 yards and three touchdowns against no interceptions and also rushed for 60 yards and another score. “Their quarterback played exceptionally well for them today, and I thought their receiver played exceptionally well,” Hanover coach Matt Heuer said. Hanover which finished with 754 points, six shy of the eight-man scoring mark set by Osborne last season, never led. 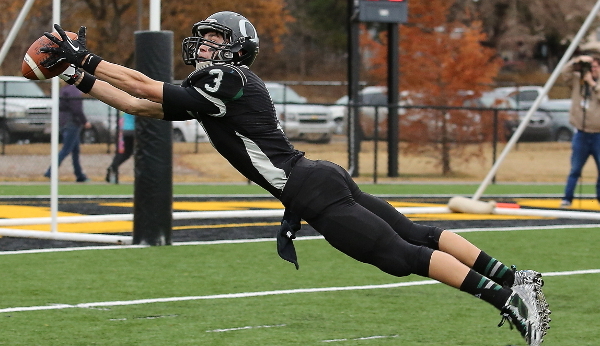 Central Plains finished with 53 plays for 434 yards, while the Wildcats had 61 plays for 337 yards. Hanover had three interceptions and seven penalties, including two that called back touchdowns. Senior quarterback Andrew Bruna completed 19 of 29 passes for 230 yards for three TDs against three interceptions. He rushed 25 times for 84 yards and a score. Hanover senior fullback Cody Rengstorf (knee) missed most of the game, though Oiler junior tailback Jacob Warnken played hurt and was limited offensively. Bieberle delivered his first big play three minutes into the ball game. Known for his highlight reel grabs, Bieberle fully dove and caught the back end of the ball as he fell into the end zone for an 8-0 lead. Bieberle thought the ball was going to pop out when he hit the ground. Hanover closed the gap to 8-6 on the next possession, but the Oilers took a 14-6 lead early in the second quarter. Crites, who avoided pressure all game and often bought himself between four and eight seconds on snaps, had several defenders near him. Just before he went out of bounds on the right sideline, he planted and threw a perfect long pass to Bieberle for a 60-yard score. The teams exchanged scores, and Central Plains led 22-14 into the final seconds of the first half. The Oilers had three plays from the Hanover 1, but Crites was stopped short each time. “That was a little frustrating,” Steiner said. Hanover recovered a short, high kick to start the second half but couldn’t score. Central Plains pushed its lead to 36-22 with 11:19 remaining after a seven-yard run by Crites. A few plays later, junior Hunter Ingham picked off a pass. Then, the roughing-the-punter penalty and a Hanover pass interference on Bieberle helped lengthened the drive. The Oilers didn’t score, but Hanover got the ball back with 3:23 remaining at its own 11-yard line. The Wildcats eventually scored with 90 seconds remaining on a 9-yard pass from Bruna to senior Hunter Nicholson. With 63 seconds left, the Oilers faced a 3rd-and-11 from its own 35-yard line. Warnken is the backup quarterback, but because of his injury, Bieberle, a former junior high signal caller, took some snaps at quarterback this week. He took the snap, went left, found a hole and scored, effectively sealing the state championship. Bieberle ended his career with an interception on the final play. The quiet leader kept saying, “There are no words" to his teammates in the postgame celebration as tears flowed. "It's still has not sunk in," Bieberle said. "It's unbelievable. That was the funniest game I have ever played in my life."